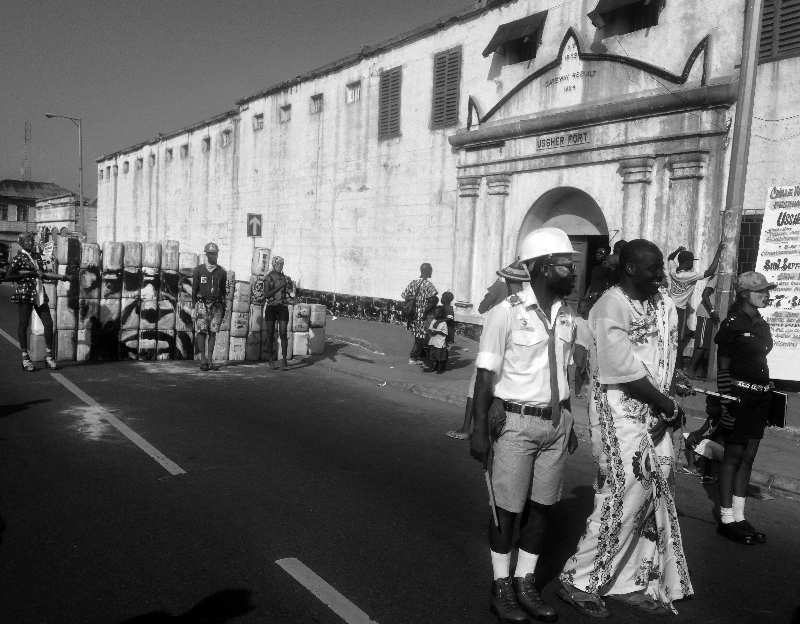 Performance artists outside Ussher Fort during Chale Wote Street Art Festival, High Street, Jamestown, Accra. Image reproduced courtesy of the photographer, Jesse Weaver Shipley. Abstract: In responding to several commentaries on his book, Oxford Street, Accra: City Life and the Itineraries of Transnationalism, the author calls upon autobiographical memories and probes their relation to fieldwork and translational transactions between various languages, pointing out that there are no easy or single sources for entextualized anecdotes or slogans. Agreeing that Oxford Street works as a pastiche or play of juxtapositions, not all of which seem clear or rationally interconnected, the author describes the challenge of cognitively mapping a spatial entity—the city—that he found to be extraordinarily complicated at different scales of signification. While attempting a "nearby history" that was relational and thus also alive in its potential for divulging meanings beyond the pieces that were conjoined, he also examined everything for its spatial implications through "a horizontal archaeology," seeking to show how seemingly self-contained phenomena are intertwined. This intersectional method aims to capture the kinetic nature of Accra’s city life while isolating its urban elements for examination. Furthermore, in considering temporalities of employment, underemployment, and unemployment, it suggests a link between the question of labor and the sociospatial dynamics that have shaped the African city and offers lessons and perspectives missed in scholarship focusing exclusively on Western cities. It is of inestimable value to see one’s work through the eyes of others. The book that is written is not the one that is read, especially when the readings, like those by the contributors to this cluster [PMLA March 2016], come from different disciplinary perspectives. Whether it is Carina Ray’s interpretation of a transnational African cosmopolitanism, Jesse Weaver Shipley’s rhythmic repetitions as if of a jazz symphony, Adẹ́lkè Adékọ́’s rememory of other African cities, Anjali Prabhu’s detection of autobiographical evasions, Alissa Trotz’s invocation of South-South dialogue, or the urban analogs to Accra that Paul Lemos Horta sees in the 1001 Nights, for me each reading of Oxford Street, Accra has been an epiphany. It is of inestimable value to see one’s work through the eyes of others. Ray and Prabhu both ask whether—and to what degree—Oxford Street is autobiographical, though they approach the question from different angles. Ray remembers the tour of Accra on which I took her in 2009, along with a few other participants in the Association for the Study of the Worldwide African Diaspora conference. She recalls this as a revelation of how much I enjoyed displaying my intimate knowledge of the city, and she saw the tour as a prognostic of what was to come in book form. I followed up that tour with several others over the years, and in each instance I became more convinced that such guided tours might alleviate the astonishing ignorance of Accra’s history. I have often toyed with the idea of starting a company that would train tour guides in urban-research methods customized for specific audiences. A mix of local and foreign students, the guides would weave an intercultural view of Accra, blending the texture of archival and ethnographic observation with the perspectives on Accra embodied by Ghana’s many diasporas. The question Ray and Prabhu raise about Oxford Street’s autobiographical inflections has once again ignited this dream, but this time in ways that require careful reflection on the relation between biography and fieldwork that I could not have anticipated when writing the book. Prabhu’s observations on the autobiographical stakes of Oxford Street are more critical. Among other things, she notes that my sojourn outside the country and the nostalgia that this has produced must have led me to turn a blind eye to, if not outright distort, some of the phenomena I was attending to as I conducted research for the book. At the most basic level the point is moot: of course Oxford Street is biographical in ways both explicit and concealed; I grew up in Accra and left it for Europe only in my late twenties. However, what was not clear to me until Prabhu’s probing was how different kinds of autobiographical detail touching on the research context generate different inflections of both the past (memory) and the present (fieldwork), in ways that do not so much distort as give a particular coloring and tenor to my account. This has methodological implications well beyond Oxford Street. The performance artist Bernard Akoi-Jackson during Chale Wote Street Art Festival, High Street, Jamestown, Accra. Image reproduced courtesy of the photographer, Jesse Weaver Shipley. I attempted to write the book from dual and perhaps even contradictory narratological perspectives, one of them recognizable to historians, the other to literary critics. While I grounded my narrative in the archival and documentary material that pertains to the city, I also displayed the texture of everyday life through anecdotes and personal observations. As varied historians and critics writing about the confluence of the historical and the literary have shown (e.g., White; Hutcheon), the two are not incompatible, though the implications that are derived from the two approaches can vary widely depending on who is reading. And so Oxford Street is littered with dates and details of historical processes relating to the evolution of the city but also with short and long anecdotes, and with some chapters—the introduction and chapters 5 and 6—reading almost like compendiums of vignettes. It will perhaps come as no surprise to anyone when I say that the vignette feature draws on a thoroughly autobiographical source. I grew up surrounded by oral storytelling. Apart from the countless Ananse folktales my father told us, stories also provided him with opportunities for giving us memorable takes on what passed for the ordinary. One such instance I remember vividly. It occurred when I was about eleven or twelve years old, just before I left for boarding school. My father often took us children on walks. Sometimes we all went together, but at other times he took one or the other of us three for a treat. This time it was my turn. We started kicking a pebble. He kicked it, and I kicked it; he kicked it, and I kicked it. After about ten minutes of this he asked me, quite unexpectedly, "How old do you think that little stone is?" I was taken completely by surprise, having never thought of a pebble in that way before. But then followed a breathtaking story of the formation of the earth, of volcanoes and avalanches, of magma and igneous rocks. The lesson: every pebble and every stone you kick has come a long way, geographically and temporally. My mother also had her own stories to tell, but since she was a trader hers were of the marketplace: rumors, gossip, and urban legends all generously leavened with a wicked sense of humor. Her stories belonged to genres that I came to discover much later in life as the transactional currencies of the city’s social imaginary; it was not for nothing that I dedicated the book to her. The context of stories and storytelling in which I grew up had a decisive impact not only on my imagination but also on my appetite for books and how I read them. I made no distinction between fact and fiction; everything I read seemed to have a specific and intense reality for me. Several people have said, either in public or in private conversation, that I must have written Oxford Street the way I did because of my training in literary criticism, but the truth is that even my decision to become a literature professor comes down to my immersion in the story worlds of my childhood. The context of stories and storytelling in which I grew up had a decisive impact not only on my imagination but also on my appetite for books and how I read them. Prabhu points to the potentially worrying methodological anomaly in my choice not to reveal the source of the story I tell at the start of chapter 1, a section of the book that centers on the history of the Tabon, the Afro-Brazilians of Accra. The story refers to a conversation between two fourteen-year-old girls in an expensive boarding school in Accra. One of the girls keeps insisting that her heritage is Tabon, much to the consternation of the second girl, an Ashanti, who is baffled by her friend’s insistence because all she sees of her friend is that she is a Ga. This anecdote, like another I shall come to shortly, is not fiction but rather the interplay among varying degrees of proximity to different aspects of myself as I researched and then wrote the book. And these selves are not all easily reducible to the autobiographical, as I hope to show in a moment. I clearly remember the conversation I had with Akosua (not her real name), the fourteen-year-old girl who told me about the talk she had had with her friend that I recount in chapter 1. I call it a conversation rather than an interview because it originally had nothing to do with Oxford Street and the research I had been doing over the previous six or seven years. Rather, one of my long-time friends had asked me to meet with Akosua and her mother so I could assess whether the girl would benefit from being my mentee. My friends routinely enlist me as a mentor, and each mentorship is established through the careful exchange of stories (call them biographical tales, if you like, but they tend to be more complex than that). Akosua came with her mother one Saturday morning in August 2010 to have breakfast with me at On the Run, the now defunct and at the time extremely popular fast-food joint at the Esso gas station right across from the main gates of the University of Ghana. On the Run was always teeming with university students, but at 8:30 on a Saturday morning things were quiet; only a few people were straggling around. After we ordered our meals the conversation proceeded through the usual pleasantries. This being the first time I was meeting Akosua and her mother, I tried first of all to find out basic things about their social background. They lived at McCarthy Hill, historically one of the poshest areas in Accra, just outside the city proper on the Weija Road. The mother had been a cloth trader at Makola Market for eighteen years and was clearly very successful. She was full of pride about her only child’s academic achievements, and I quickly came to understand why. Akosua said she wanted to be a doctor or engineer when she grew up and was obviously extremely serious about achieving this goal. After learning what school she attended and what her experience going to a private school was like, I asked her a standard show-me-your-friend- and-I-will-tell-you-who-you-are type of question, which I favor both as a means of prying information out of my own kids and as a ready icebreaker with the children of friends and acquaintances. In this case, however, the question triggered a response that I could not have possibly anticipated. After Akosua told me the name of her best friend, I asked her what made this friend so special. "Well," she proceeded enthusiastically, "she is very smart and we share all our secrets and do all our homework together. The one thing that annoys me about her," she mused without prompting, "is that she keeps saying she is a Tabon and listing the names of all the prominent people in Ghana of Tabon background as if that makes her special aaa ma." (Aaa ma is an Akan intensifier impossible to translate into English.) As she mentioned the word Tabon, the young schoolgirl I was talking to transformed into an informant, and what had been merely a casual conversation regarding a school friend became a research interview. Without having planned it, I switched into researcher mode and plied Akosua with more and more questions. Her mother, who continued to prompt her daughter and remind her of details about the friendship that she might have forgotten, was relegated in my mind to the role of irritating bystander. To her my incessant questioning was the sign of tremendous interest in mentoring her daughter. I was of course impressed by Akosua, but not in any way that I could have explained to either her or her mother. As soon as Akosua mentioned the word Tabon all details of our breakfast conversation, its setting, and even the ambient color and sounds of On the Run became focalized through this one research category. Everything except the information she was giving me faded into the background. Thus, when I came to write the chapter I could call to mind only the focal point of the conversation, its primary node, if you will. In fact, until I read Prabhu’s query I never remembered any of the conditions surrounding the conversation itself. This process of focalization has important implications for the ways in which we transform the messiness of fieldwork into a finished written product, but before I elaborate on these implications let me proffer another example of focalization, this time from what is a more explicitly autobiographical experience. Readers of chapter 4 will note the many examples of tro-tro slogans and inscriptions I provide there as a way of illustrating the social imaginary of transition that is central to Accra’s expressive economy and thus to its urban landscape. One of the slogans I refer to in that chapter is "The World Is a Stage," which had been inscribed on all eight passenger and freight lorries owned by my uncle at Nsawam. As a youth I spent one wonderful summer with him and my aunt and got to see at close quarters not only his extraordinary love of driving but also the way that the slogan had become his primary identifier for both friends and casual acquaintances. When strangers came into town looking for him they were directed to look for "The World Is a Stage," which had become his famous moniker. Written in elaborate calligraphy, the slogan was split into two: "The World" written boldly on the front headpiece of the vehicles and "Is a Stage" splashed on the back. The words, in his favorite colors—yellow and blue—could be recognized from a distance. And whenever he appeared in company he was hailed with "The World," to which he would promptly reply, "E-ye (is a) Stage." I must have been thirteen that summer. Coincidentally, we were being introduced to English literature at that time through an anthology of literary excerpts, one of which was Jacques’s famous "Seven Ages of Man" speech from Shakespeare’s As You Like It. On encountering my uncle’s tro-tro slogan I assumed, without thinking it unusual, that the slogan must have been culled from Shakespeare. This assumption became so ingrained in me that thirty-five years later, as I wrote Oxford Street, I remembered him as a closet Shakespearean. There is no reason to believe that "The World Is a Stage" may not have been taken from As You Like It, but, recently, in preparing a talk for the 2016 MLA presidential plenary session “Literature and Its Publics: Past, Present, and Future,” I completely revised my view of the slogan. The central argument of my remarks at the session turned on the fact that the inherent polysemy of African oral genres has an impact on the mechanisms of transfer and transposition across the semiotic landscapes in which the genres are located. As anyone familiar with the folklore-inspired novellas of Amos Tutuola will attest, an oral story likely contains songs, several proverbs and wise sayings, a puzzle or two, and ample references to real-life events surrounding the storyteller and his or her audience. Crucial to understanding the mechanisms of transfer and transposition from oral genres are the forms of entextualization that define the layered and interconnected modes of transfer and transposition that occur in an African urban landscape. In her book The Anthropology of Texts, Persons and Publics (2007), Karin Barber defines entextualization as the processes by which an instance of oral discourse is transformed into a written text. The processes vary, but inherent to entextualization is the assumption that meaning is free to circulate across both oral and literary platforms and that it is not "owned" by anybody. Thus, there is nothing like plagiarism in the urban public commons suggested by tro-tro slogans. What we must add to Barber’s formulation is that entextualization is not limited to the relay between orality and writing but takes place regularly across citational networks that may have an oral basis but may also have been transposed from a written source that had been dissolved into the resources of orality before being restored to the ambiguous place of writing. Such is the case with slogans drawn from the Bible and the Koran, as well as from some perennially circulating literary texts first introduced into the educational curricula as far back as the colonial period, like the plays of Shakespeare, Pilgrim’s Progress, and Alice in Wonderland. Entextualization in the public commons of urban inscription thus defines a citational circuit that is neither linear nor straightforward. The contrast with literary intertextuality is instructive, for whereas intertextuality conventionally implies an earlier and likely written work that a later writer draws on and that is safeguarded by the interdictions of author copyright, entextualization suggests transfers across multimodal platforms with no clear priority of sequencing among them. Furthermore, the nature of multilingual environments in Accra and in much of Africa means that the writing we see on lorries and other sites across the urban landscape is also the product of translational transactions between various languages (Quayson 135–41). Even when the inscription is in English or another europhone language, the translation does not entirely efface the multilingual local language sources from which it may have been derived. Translation in a multilingual context regularly estranges the English-language text, raising doubts about what kind of English it was in the first place. Crucial to understanding the mechanisms of transfer and transposition from oral genres are the forms of entextualization that define the layered and interconnected modes of transfer and transposition that occur in an African urban landscape. As I prepared for my MLA talk, it struck me that there were two plausible reasons my uncle’s favorite slogan could not have come from Shakespeare after all. First, my uncle was not known to have had many classmates in his lifetime, and, second, there are at least two Akan proverbs that hint at or directly reflect on the fact that the world is a stage. The two Akan proverbs—"Obra ye akuantuo tin- tin" ("Life is a long journey") and "Obra pa gya owura kwan" ("It is good character that illuminates a person’s life path")—both recognize the intricate relation between this life and the one to come. Thus, my uncle’s slogan was most likely the English-language entextualization of such Akan proverbs, which derive from a holistic sense of the sometimes volatile proximity of the world of the living to that of the dead. To achieve this awareness we must treat everyone we meet on life’s journey with caution and respect. This is not to say that as urban observers we are blocked from seeing a literary source for "The World Is a Stage," but the source, whatever it may turn out to be, is not as important as the entextualization and the related translational transactions between English and the multilingual context out of which tro-tro slogans emerge. Once we explore tro-tro slogans through the prism of entextualization, we find that we are no longer allowed to settle for easy or even single sources for them, as I mistakenly did in attributing my uncle’s favorite slogan to a singular Shakespearean source. 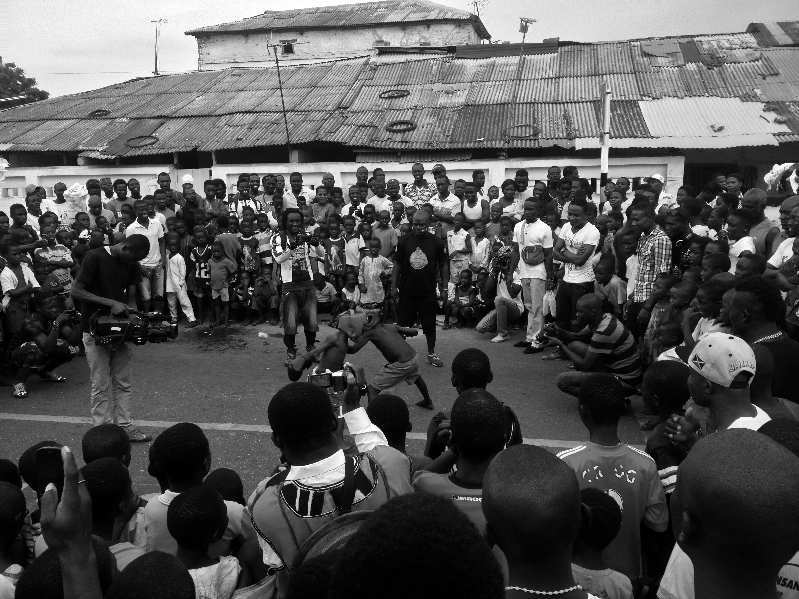 Organized youth boxing, High Street, Jamestown, Accra. Image reproduced courtesy of the photographer, Jesse Weaver Shipley. So what does it mean to probe the relation between autobiography and fieldwork in an urban study such as Oxford Street? Toward the end of his remarks, Jesse Shipley refers to the affective qualities of space and time and to qualia, "semiotic nodes around which social subjects create value and meaning in emotional and sensorial terms." Following Thomas Nagel’s landmark essay "What Is It Like to Be a Bat?" (1974), philosophers have used the term qualia to refer to the phenomenal character of mental states that are accessible through introspection. These cover states as varied as perceptual experiences (e.g., seeing colors), bodily sensations (e.g., a twinge of pain or hunger), reactions or passions (e.g., delight, love, and regret), and, finally, moods (e.g., elation and depression). In the long entry by Michael Tye in the Stanford Encyclopedia of Philosophy, from which I sought guidance on the concept, all the examples of qualia pertain to emotional and phenomenal states, while none illustrate interpretive ones. While the concept of qualia is attractive for explaining the conceptual focalization through the term Tabon that took place in my conversation with Akosua, it is rather the semiotic-discursive operation that the term performed on being mentioned by her that seems to me most pertinent to understanding the moment itself and what I later came to do with it. And yet this semiotic-discursive operation is not "autobiographical" in any straightforward sense, since what it brought forth to impinge upon the conversation with Akosua was not an experience deriving from my distant past, like listening to folktales as a child, but the focalization through a concept that had been shaped by the ongoing research process itself. For by the time I met Akosua the term Tabon was still taking shape in my mind. And it became fully formed only much later, as a way to understand the long and complex process of ethnicization with which I concluded the discussion of the Tabon in that chapter. My conversation with Akosua was thus both processual and dialectical: on the one hand, the mention of the word Tabon focalized the casual conversation I was having with her through an "ethnic" concept; on the other hand, what she told me about her friend distilled for me an important aspect of ethnicization that had not been evident before our conversation. The ethnicization of the Tabon is historical in a way that transcends the scales of group and individual self-fashioning implied in the disposition divulged by Akosua’s friend. For as Ray adroitly shows in her remarks in this cluster, the history of the Ga suggests a sliding scale of Ga-ness, in which the Tabon gradually acquire the trappings of Ga identity while struggling to retain important markers of their cultural difference, such as their names and the ways they alter and customize the Ga Homowo festival rituals. More important, Ray also shows how the relation between Ga and Tabon identity is being reconfigured under the aegis of globalization. With the animation of the Ghanaian-European heritage industry, the Dutch, the Danes, the British, and the Afro-Brazilians of Accra benefit from the transnational commodiication of cultural identities. 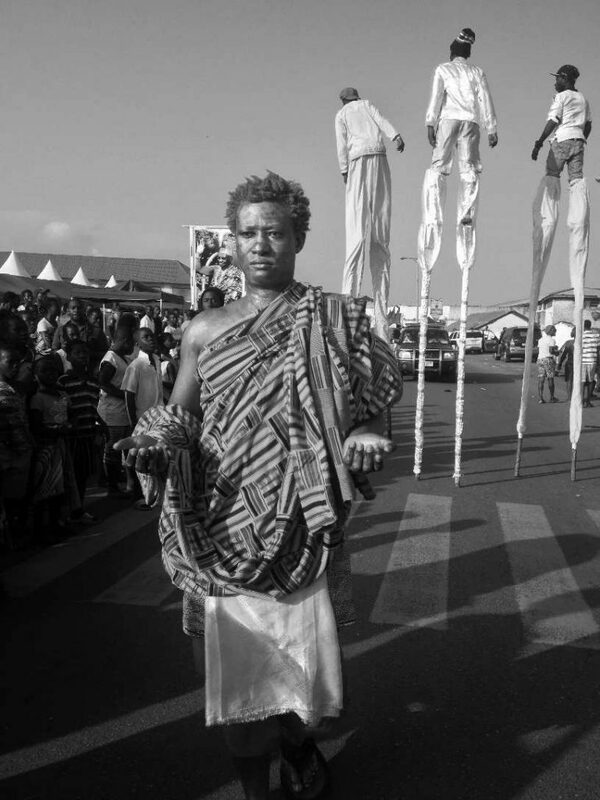 Lula’s visits to Ghana in 2005 and 2007 allowed the Tabon to join this larger transnational circuit of heritage revitalization and lent them the capacity to be simultaneously Ga and something more than Ga: conduits of a transnational and cosmopolitan hybridity that has roots in the mid–nineteenth century but is being reconfigured today. The question I struggled with most in writing the book was how to cognitively map a spatial entity—the city—that I found to be extraordinarily complicated at different scales of signification. All the contributors to the cluster [in PMLA] note the degree to which Oxford Street works as a pastiche or play of juxtapositions, not all of which seem clear or rationally interconnected. Trotz and Shipley speak about the intersectionality of the details I chose to explore and point to the ways in which it invites comparisons across scales and geographic designations both inside the city and extending well beyond it, sometimes to cities elsewhere in the global South. Shipley is kind enough to interpret the inherent gaps among the juxtaposed fragments as being of a piece with proverbial discourse, in which a permanent sense of incompletion teases us into further thought. The question I struggled with most in writing the book was how to cognitively map a spatial entity—the city—that I found to be extraordinarily complicated at different scales of signification. Bearing in mind Michel de Certeau’s distinction between the city as perceived from above, by "a solar Eye," and as experienced by an individual at street level, in fragments (91–96), I endeavored to illustrate both views of Accra while leaning firmly toward the latter. Thus, I explored the city’s history on different scales—for example, its history and evolution as a whole from the 1650s to today and, simultaneously, the different historicities of its constituent parts, such as Ga Mashie, Osu, Kaneshie, and Kokomlemle. Sometimes I abandoned the juxtaposed historical scales for a thoroughly spatial one, which nevertheless remained resolutely relational. Thus, Tudu and Makola were compared in terms of their spatial contiguity while Oxford Street, Accra Mall, and Makola were contrasted in terms not of contiguity but of their different commercial morphologies and the shopping experience that was to be had in them (24–28). I contrasted Chorkor, Korle Gonno, and Ridge to pinpoint the differential social ecologies that have been generated by government interventions in the housing market. The colonial administration developed Chorkor from a fishing village into low-cost housing estates to host American servicemen at the start of World War II, while Korle Gonno grew in response to the yellow fever epidemic of 1908. But Ridge was a direct result of the colonial impulse toward racial segregation that began officially in 1898 and progressed steadily until the end of the 1930s. Chorkor and Korle Gonno are now primarily rental slums while Ridge remains the long-time delight of the ruling elites and their satellites and is still one of the most sought-after residential neighborhoods in Accra. As the remarks by Adékọ́, Trotz, and Horta show, the internal spatial analogies and comparisons I set up in Oxford Street suggest other ways in which the book might be used to deliver a payout of analogs for thinking about urbanism elsewhere. This was partly my own aspiration for the book. But Horta shows that the analogies do not need to work exclusively in spatial terms (i.e., transposing from Accra to other cities). They can also provide a metaphoric payout. When he reads from Oxford Street to explore ideas of urbanism in the 1001 Nights, he is unpacking the book as a source of emblematic theory for application in ways that I could not have foreseen. The temptation to read back from Horta into Oxford Street is one that I will have to resist for now, but I wonder what it would be like to transpose from his readings of the urban in the 1001 Nights into the category of spatial traversal that I elaborate in chapter 7, where I focus on literary representations of Accra. The challenge for literary criticism (not just of the postcolonial variety) has been to describe space without lapsing into the brute sociology of context or the esoteric numerology of measurement. For space is never just content or measure but the symptom and producer of social relations, as various Marxist thinkers have taught us. Literary theory has barely caught up with this insight. The challenge for literary criticism (not just of the postcolonial variety) has been to describe space without lapsing into the brute sociology of context or the esoteric numerology of measurement. For space is never just content or measure but the symptom and producer of social relations, as various Marxist thinkers have taught us. Literary theory has barely caught up with this insight. One of the major challenges of writing Oxford Street was taking account of existing versions of ethnic urban history (of the Ga, primarily) while incorporating a thoroughly spatial sense of that history. Two methodological procedures were required to accomplish this: the first was to attempt a "nearby history" that was relational and thus also alive in its potential for divulging meanings beyond the pieces that were conjoined, and the second was to examine everything for its spatial implications. In Nearby History: Exploring the Past around You (2010), David E. Kyvig and Myron A. Marty give a detailed account of how to understand lived history that has not yet been archived. They rely on a mixture of forms of street-side ethnography and research into ephemeral sources of the nearby (e.g., interviews and diaries about the establishment of new churches and community groups). One major difference between the method elaborated by Kyvig and Marty and what I do in Oxford Street is that I never allow any detail to speak by itself. Rather, through what I term a horizontal archaeology, I seek to show how every phenomenon, whether cultural, social, economic, or otherwise, is entwined with other phenomena even if it initially appeared to be self-contained (x, 31–32). The intersectionality of this kind of method is far from wayward; the point of it is to capture the kinetic nature of Accra’s city life while isolating its urban elements for examination. As I have noted already, questions of space and spatiality were crucial to my model of writing the city, particularly as I sought to take into account the dominant model of ethnohistories that had been written about the city and to ground them in a thoroughly spatial identity. The spatial implications of the Tabon are well rehearsed in chapter 1, but significant too are the many remarks about northern migrants and their settling in the various stranger quarters—called zongos in Hausa—that have historically been located on the outskirts of the city. In the colonial period the zongos were populated by migrants from the Northern Territories, and later Independence by migrants from what are now the Northern, Upper West, and Upper East regions of Ghana. Claims on the city that the Ga presented to the colonial administration were often couched in terms that cast the residents of zongos as aliens, and controversial legal cases on land acquisition made sure that fictive autochtony was structured in opposition to them in ways that evoked the full ethnoracial logic of colonial rule. This is the subject of chapter 3 that Adékọ́ picks up on in his remarks. The history of Accra also shows a range of inter-zongo migrations from the early twentieth century onward, so that it was not uncommon to find that some of the zongos broke up to form other stranger quarters elsewhere in the city that could take advantage of colonial labor opportunities. Thus, for example, the zongo township of Madina, founded in 1936, drew residents from other zongos in Accra and was encouraged by the colonial government to service Achimota College and the University of Ghana at Legon, the prestigious academic institutions that had been established some seven miles northeast of the central districts of Accra in 1927 and 1948, respectively. (Legon originally evolved from Achimota in the 1940s.) And although it has changed over time, Madina remains the preferred reservoir of cheap labor for the college corridor. The spatial focus of Oxford Street allows anyone that might be interested to create a map of the city that diverges from the inert cartography available in government maps and documents. Urban theorists face a severe challenge in talking about poverty. Urban theorists face a severe challenge in talking about poverty. The policy-oriented documents that have dominated studies of African cities have generally typified them as sites of crisis that require urgent intervention from governments, nongovernmental organizations, and international organizations. Furthermore, the poor are cast in a role that is conditioned by different dimensions of outsider identity that is taken to pose a threat to the existing order. As Kevin McNamara notes, there are four principal types of narrative positions assigned to economic outsiders: "Romantic underdog, moral problem, oppositional social force, and alienated individual" (6–7). Accra’s zongos provide important sites for interpreting each of these economic outsiders; in chapter 6 and in the conclusion I focus on the kòbòlò, commonly assumed to be a good-for-nothing loiterer with a disposition toward criminality. I elaborate how the kòbòlò is not an urban type easily explicable through the modality of the informal economy but a complex sociological category that allows us to see the intersections between unwaged labor and urban free time. I recommended that urban free time be tied securely to the status of labor, especially to the vagaries of transition between the different temporalities of employment, underemployment, and unemployment, and that it may not be entirely out of place to link the question of labor to the sociospatial dynamics that have shaped the African city. In this light I proposed a preliminary formula for unthreading the general implications of urban free time—to wit, that the poor have time while the rich have leisure. Or, as Ackbar Abbas noted at the Johannesburg Workshop in Theory and Criticism in 2014, the poor have time while the rich have space. But free time is not the same as freedom; it is experienced in the informal economy as a burden. For the urban poor everywhere in Africa are keen to exchange their free time for labor time—that is, to undertake forms of labor that provide a regular income and give predictable rhythms to everyday life. As Trotz asks, how might we rethink the question of urban free time from a gendered perspective? As she adroitly puts it, if the urban (male) poor have time and the rich (both male and female) have space, poor urban women have neither space nor time. Since Oxford Street featured many women characters (esp. in chapters 5 and 7), Trotz’s question is more than a prompt to think about inserting women into accounts of the urban. It is a challenge to completely rethink class relations from the point of view of gender, which means understanding how colonial urban planning and postcolonial space making were conducted to masculinize the city. There is at least one way in which Accra has historically been gendered male, and that is in the split between markets as the sites of female unruliness and government as the source of rationality, read without any sense of contradiction as male. All markets in Accra are periodic markets (i.e., they meet on particular days of the week) and are dominated by women. During decolonization market women were judged to be such crucial engines of information and public opinion that Kwame Nkrumah made sure that the women’s wing of the Convention People’s Party was fully helmed by market women. They were his staunchest supporters. With the economic vagaries of the 1970s, however, politicians of different stripes began demonizing the market women, accusing them of being responsible for the shortage of essential commodities (all of which were actually imported). This resentment culminated in perhaps the most dastardly attack on the burgeoning women’s collective that had progressively developed through the markets. In 1979 Jerry John Rawlings, the military head of state, evacuated the fifty-year-old Makola Market and bombed it from the air (Robertson). This act fundamentally undermined women’s capacity for capital accumulation and indeed for labor organization and the passing down of commercial know-how to their daughters and to other women. The problems that the women of Makola faced were subsequently compounded by the liberalization of the economy starting in the late 1980s, which triggered the upsurge of transnational capitalist investment and the further marginalization of women from the corridors of economic power. There are few if any female industrialists in Ghana today, and this can be traced directly to the damage that was wreaked on their sources of accumulation under the Rawlings regime. A thorough account of women’s status in Accra’s economy might have shed light on the structures of gendered exclusions that have come to shape the city and that go beyond the feminization of poverty that we also see in the city today. All these are not so much things to regret not including in the book as pointers for further research. We Africans have no time to die thinking only about cities not our own. It is time to break free of that narrow model. If at the heart of Oxford Street lies an attempt to propagate an African example for theorizing the urban, it is not because we are exhausted by New York, or London, or Paris, or Moscow, or Guangzhou. After all, some may argue that given the nature of transnational migrations since the 1950s these have all become African cities in one way or the other. Rather, it is no longer feasible in our deeply interconnected world to think of one part of it as merely generating raw unprocessed data and another as delivering the object lessons for thinking universal categories, whether urban or otherwise. For there are lessons that Accra, and Lagos, and Nairobi, and Johannesburg, and Cairo can teach the world that should qualify the perspectives generated from an exclusive focus on the Western city. As the tro-tro slogan in my title asserts, such an attitude still makes me laugh, for we Africans have no time to die thinking only about cities not our own. It is time to break free of that narrow model. Tye does not suggest that the mental states invoked by the term qualia are not interpretive, but the question is the source of serious contention among philosophers. Teresa Brennan robustly defends the position that qualia includes interpretive states. My experience of listening to stories as a child is subject to further conceptual parsing and elaboration. For, strictly speaking, it was both incremental and iterative—that is, repeated several times over a long period. Were I to pause and think about particular stories and the contexts in which I first heard them, I have no doubt that a different reality of my childhood story listening would reveal itself, a reality that might pertain to a further understanding of my procedures for Oxford Street. This tantalizing possibility will have to wait for another occasion. Many of Accra’s neighborhoods were developed in response to the exigencies of World War II. Apart from Chorkor, these included Osu RE, the "RE" referring to the Regimental Engineers, who camped in tents in that area and lent their name to it; and what later came to be known as the Airport Residential Area, a plush complex originally set up to house employees of Pan Am Airways. Pan Am was the American carrier preferred for flying soldiers, supplies, and (let it be added!) Coca-Cola into Accra, which was the Allied headquarters in the region.Coca-Cola speaks proudly of its efforts in support of American soldiers during the war. Its Web site does not directly refer to the company’s contributions in West Africa, but its influence in that region can easily be extrapolated from what the site says about Eisenhower’s insistence on supplying the drink as a morale booster for American soldiers. In 1939 Coca-Cola had only five bottling plants, but by 1945 it had sixty-four in countries around the world, including France, Guatemala, Algeria, Honduras, Mexico, Belgium, Italy, Peru, Spain, Australia, and South Africa. Over five billion bottles were distributed to servicemen and servicewomen during the course of the war, those stationed in Ghana and West Africa being no exception ("Chronicle"; "History"). Abbas, Ackbar. 2014. Response to "The Right to Have Rights in Cities of Migration," by Michael Keith. Johannesburg Workshop in Theory and Criticism. BAT Centre, Durban. July 4 address. Barber, Karin. 2007. The Anthropology of Texts, Persons and Publics: Oral and Written Culture in Africa and Beyond. Cambridge: Cambridge University Press. Certeau, Michel de. 2011. The Practice of Everyday Life. 3rd ed. Berkeley: University of California Press. Coca-Cola Co. 2016. "The Chronicle of Coca-Cola: A Symbol of Friendship." Coca-Cola Journey. Coca-Cola Co. Website, accessed 20 January. Coca-Cola Co. 2016. "History." Coca-Cola Journey. Coca-Cola Co. Website, accessed 20 January. Kyvig, David E., and Myron A. Marty. 2010. Nearby History: Exploring the Past around You. 3rd ed. Lanham: Altamira. McNamara, Kevin R., ed. 2014. The City in Literature. Cambridge: Cambridge University Press. Nagel, Thomas.1974. "What Is It Like to Be a Bat?" Philosophical Review 83 (4): 435–50. Quayson, Ato. 2014. Oxford Street, Accra: City Life and the Itineraries of Transnationalism. Durham: Duke University Press. Robertson, Claire. 1983. "The Death of Makola and Other Tragedies." Canadian Journal of African Studies 17 (3): 469–95. Tye, Michael. 2015. "Qualia." Stanford Encyclopedia of Philosophy. Stanford Center for the Study of Language. and Information, 2015. Accessed January 20, 2016. White, Hayden. 1973. Metahistory: The Historical Imagination in Nineteenth-Century Europe. Baltimore: Johns Hopkins University Press. This article originally appeared in PMLA 131, no. 2 (March 2016), pp. 528–539, under the title “‘Still It Makes Me Laugh, No Time to Die’: A Response,” published by the Modern Language Association of America. © 2016 by Ato Quayson. Republished here by permission of the author and MLA. DOI: pmla.2016.131.2.528.